← Who owns the emissions? We do. A slightly nervous looking Cllr Nigel Murphy, the new Executive Member for the Environment, kicked off this exhibition and conference of sustainable building held over two days at GMEX (now known as Manchester Central). Our new Executive Member must still be getting up to speed with his new portfolio as his introduction to the A Certain Future report lasted around 12 minutes rather than the expected half an hour. To be fair this was his first speech on the subject and its probably too early to judge his abilities although his recognition that the Council “does not have all the answers” is a good start. The speech, which he had only looked at early in the morning and was reading word for word, was lacking conviction. However, in it Cllr Murphy reaffirmed the 10:10 pledge to carbon reduction, and suggested that Manchester City Council was the largest organisation taking part in this scheme. This civic boosterism characterised much of the presentation with claims such as “the only UK city to involve stakeholders” in the climate change strategy and the distinctive “original modern” approach to climate change that we are apparently taking continuing that well loved narrative about the greatness of the city so beloved by our leaders. The exhibition and conference, a two day event, provided a showcase for the “latest ideas, products and technologies that help reduce the environmental impact of building” and there were dozens of companies displaying these solutions. From Malaysian timber housing systems to green roofs this was a reminder of the economic opportunities that are presented by climate change and sustainability needs. This underlying economic opportunity orientation of the event was confirmed when Cllr Nigel Murphy suggestion that there are “significant economic opportunities for cities that grasp this challenge” woke up the early morning crowd of developers, architects and builders. 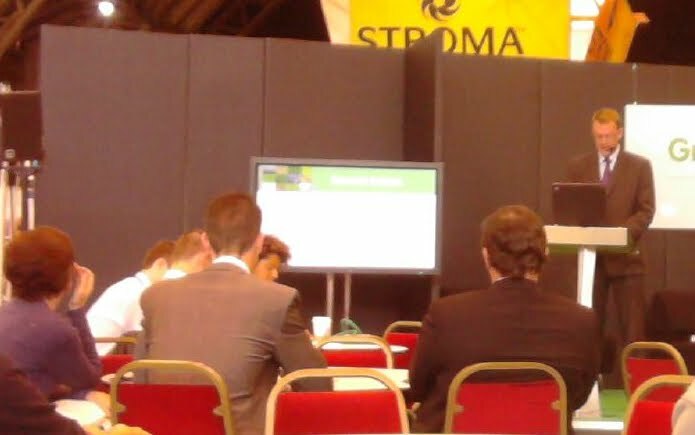 With dozens of seminars from building green schools to the benefits of biomass providing a good opportunity to learn about some of the building/construction issues facing the industry and showed how these companies are at the forefront of developing new technological solutions to renewable energy systems. Yet this could be the weakness of the event with its focus on business and technology there seemed to be a number of unmentionable issues especially anything to do with politics. In fact the whole event seemed to be devoid of climate change politics or the need to make some increasingly tough decisions about our lifestyles with technology being positioned as the solution to all our worries. This was also reflected in seminars by Chris Birch and Robert Shaw, both directors of sustainability at planning consultancies who gave presentations looking at the planning systems and master planning. Using formulas such as P* + A* + T* = environmental impact or statements such as “everyone has a role to play in delivering the new paradigm” the speakers seemed to get lost in a world of built environment expertise and technological configurations that speak of a business as usual approach. Another ‘elephant in the room’ was the economy with questions of funding for all these schemes being greeted by smiles and nervous laughter. The Green City team at the Council stand seemed to pass on the burden of its strategy to the mythical ‘business partner’ but there was no clear evidence that anyone in the conference had any idea about how their solutions could be delivered on a scale beyond the ubiquitous experiment or case study. Still, there was lots of ideas and inventions at the conference, clever people coming up with all manner of energy-saving and generating devices of the future. It will be interesting to see how these develop in our new economic climate. This entry was posted in Cllr Nigel Murphy, Green Expo. Bookmark the permalink.